Is Bicycle Face a Complete Farce? You may be wondering, what is “bicycle face”?... why hasn’t my doctor warned me? The symptoms are as follows: Increased mobility, greater focus, confidence, independence, and improvement in general health! Doctors cautioned this condition could become permanent with repeated use of the bicycle and was very prevalent among female riders. 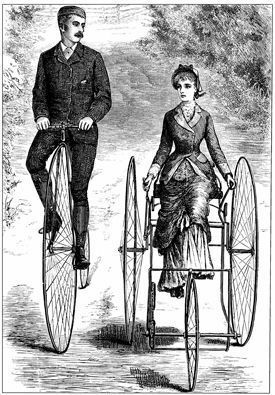 “Over-exertion, the upright position on the wheel, and the unconscious effort to maintain one’s balance tend to produce a wearied and exhausted ‘bicycle face.’” The only way to avoid developing Bicycle Face was to avoid the bicycle altogether! Good news female cyclists: the verdict is out and although you may show physical signs of bicycle face while you ride, it is not permanent. So, go enjoy a ride, all of the other side effects are worth it!